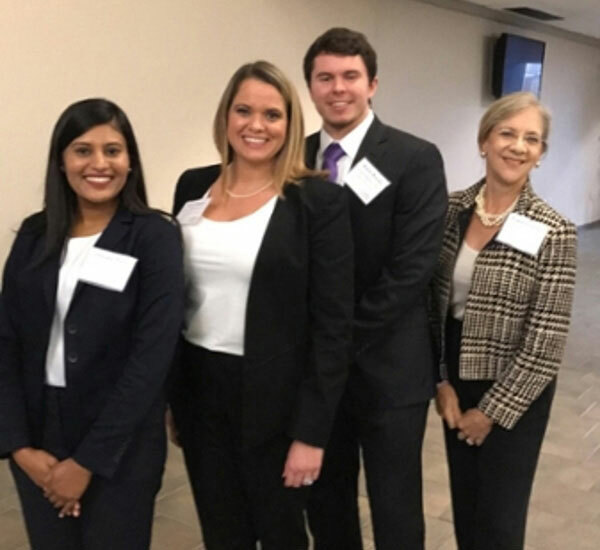 A team of Accounting majors representing Middle Georgia State University's School of Business placed second at the 7th annual Internal Audit Case Study Competition recently held at Kennesaw State University. Sponsored by the Atlanta chapter of the Institute of Internal Auditors, the statewide competition is open to all undergraduate and graduate students enrolled in Georgia colleges and universities. MGA's team members were Aaron Bandy, Amy Harper and Shivani Patel. The case study competition emphasizes the importance of business processes, analysis, controls, and internal audit review as student teams evaluate a complex business scenario. MGA’s team was selected as one of the top 10 for the final round of competition, having battled 27 undergraduate and graduate teams from other institutions, including the University of Georgia, Emory University, and Georgia Institute of Technology. Sargent noted that this is the fourth consecutive year that MGA made it to the “podium” (first, second or third place) and is the only University to do so in the history of the competition. Recognized for their research and analysis of MillerCoors, the MGA team's chosen firm, each member received a $500 cash award for second place.